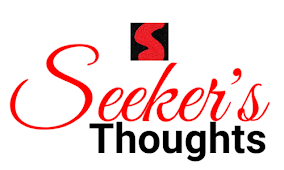 The fear is that high population numbers are putting further strain on natural resources, food supplies, fuel supplies, employment, housing, etc. in some of the less fortunate countries. In biology or human geography, population growth is the increase in the number of individuals in a population. 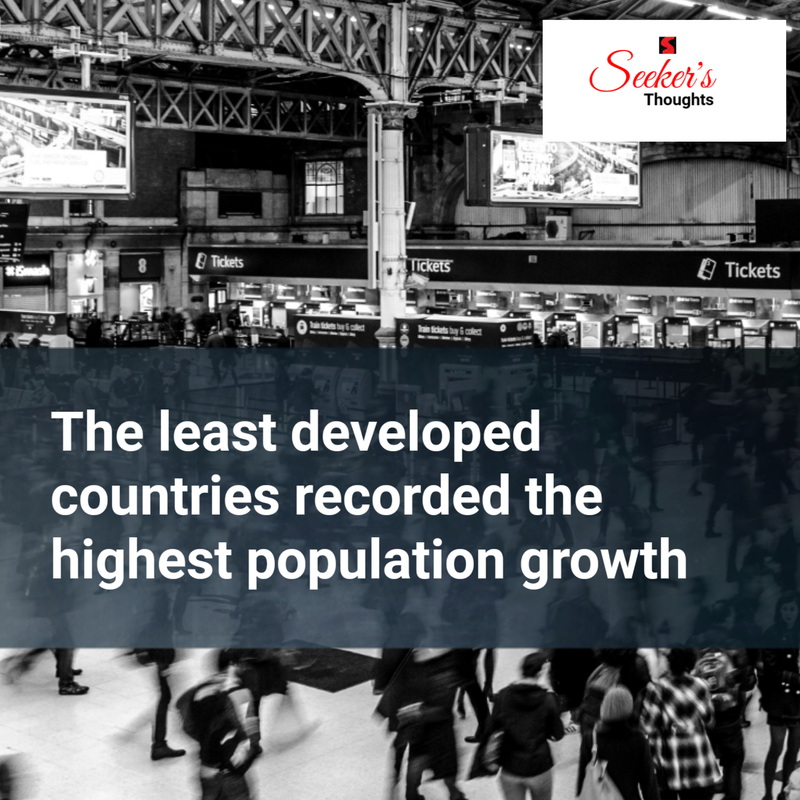 Many of the world's countries, including many in Sub-Saharan Africa, the Middle East, South Asia and South East Asia, have seen a sharp rise in population since the end of the Cold War. 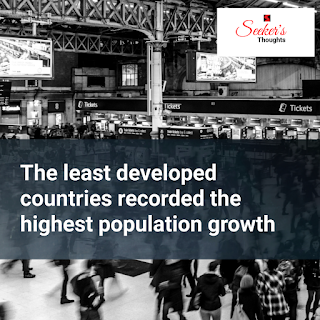 According to the United Nations Population Fund’s report state of the population 2018 – India’s population grew at an average annual rate of 1.2% between 2010 and 2019 to 1.36 billion, growing from 942.2 million in 1994 and 541.5 million in 1969. In comparison, China's population stood at 1.42 billion in 2019, growing from 1.23 billion in 1994 and 803.6 million in 1969. More than double the annual growth rate of China. The latest report released on 10th April 2019. 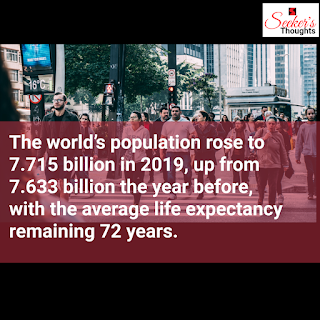 The report stated the world’s population rose to 7.715 billion in 2019, up from 7.633 billion the year before, with the average life expectancy remaining 72 years. Much of the overall increase in global population till 2050 is projected to occur in high fertility countries, mostly in Africa, or in countries with large populations, such as India and Nigeria. The recent past has seen enormous changes in fertility rates and life expectancy. 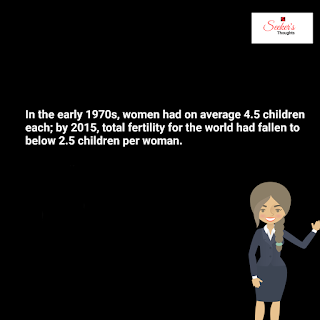 In the early 1970s, women had on average 4.5 children each; by 2015, total fertility for the world had fallen to below 2.5 children per woman. Meanwhile, average global lifespan has risen, from 64.6 years in the early 1990s to 70.8 years today. According to the report, in India total fertility rate per woman was 5.6 in 1969, dropping to 3.7 in 1994 and 2.3 in 2019. India recorded an improvement in life expectancy birth. The life expectancy at birth in 1969 was 47 years, growing to 60 years in 1994 and 69 years in 2019. India’s population composition in 2019 the report said 27% of the country’s population was in the age bracket of 0-14 years and 10-24 years each, while 67% of the population was in the 15-64 age bracket. Around half India’s population in 24 states have achieved so-called replacement fertility rates of 2.1 children per women, which is the desired family size when the population stops growing, but the country’s large youth bulge will continue to fuel population growth even as the size of the aging population increases. Employment for young people is critical, as is developing public policies for the elderly on pension, services and support and customized safety nets. The poorest 20% of households have the largest unmet need for contraception and reproductive health services, with adolescent, disabled, unmarried young people, and the socially marginalized being the most deprived. India has made some ground breaking shifts the policy and moved from target approach to family planning services and methods to a rights-based approach, but it has still not fully moved away from sterilization incentives and disincentives, winch should never have been used according to the population foundation of India. A girl who marries when 10 are will probably leave school. And because she leaves school, she won’t get the negotiating skills, and she won’t get the specific skills which will allow her to then great a better-paid job. 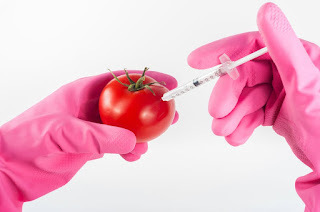 The huge growth in the world population over the past two countries is largely resulting of advances in modern medicines and improvements in living standards. These have significantly reduced infant, child, and maternal mortality, contributing to an increase in life expectancy. Although fertility levels have declined, they have not fallen at the same pace as mortality levels. 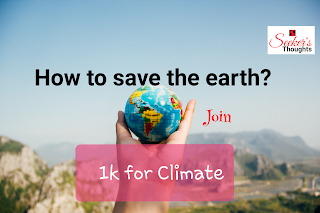 The world population will continue to grow for decided to come. This is the result of ‘population momentum’ because of improved survival rates and past high fertility levels; there are more women of reproductive age today. This will contribute to a relatively large number of births, even if those women have fewer children on average. Although population growth is, today, largely attributable to population momentum, after 2060 it will almost exclusively be driven by fertility levels in the world’s least developed countries. Population dynamics can be shaped by policies. But these policies must strengthen, rather than weaken, fundamental human rights and freedoms. Population dynamics are the cumulative result of individual choices and opportunities, and they are best addressed by enlarging these choices and opportunities- especially those related to sexual and reproductive health and rights. When couples can freely decide the number, timing, and spacing of their children, evidence shows more children survive and thrive, and overall fertility levels trend downward. Sexual and reproductive health and rights also make an enormous difference in the health and lives of all people, especially women, by dramatically reducing maternal and infant mortality rates, helping to prevent lives. Despite these concerns, The UNFPA report highlights that untold millions have enjoyed healthier and more productive lives in the 50 years since the agency was founded, thanks to pressure from civil society and governments to dramatically reduce unintended pregnancies and maternal deaths highlighting positive changes in the last half-century. Looking ahead to future challenges, the UN agency highlights the threat to women’s and girl’s reproductive rights posed by emergencies caused by conflict or climate disasters. 72 years of India independence: country’s growth story from then to Now in Novembers. About 35 million women, girls, and young people will need life-saving sexual and reproductive health services this year, as well as services to address gender-based violence, in humanitarian settings, it warns. Every day, more than 500 women and girls including in countries with emergency settings, die during pregnancy and childbirth, due to the absence of skilled birth attendants or emergency obstruct procedures. 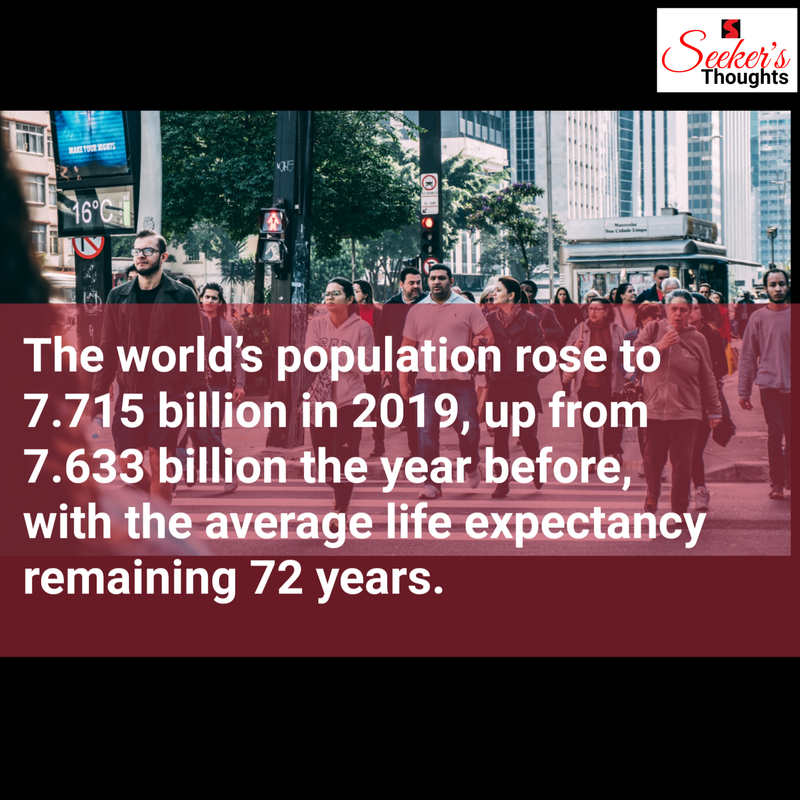 India must prepare for its growing aging population by understanding the dynamics and riding its demographic dividend by making sure young people are well educated, healthy and contribute to society to help grow the economy and look elderly going forward. United Nations population fund is one of the world’s largest supporters of population data collection. In addition to supporting censuses and surveys, UNFPA works with policymakers, civil society, health care providers and educators at all levels to promote sexual and reproductive health and rights- including voluntary family planning.